This easy yet elegant dessert is a delightful treat any time of year. Place butter and lemon juice in a baking dish. Place the baking dish in the oven just long enough for the butter to melt. While butter is melting, peel bananas and cut into 3 inch sections. When the butter has melted, remove from the oven and stir until butter and lemon juice are well mixed. 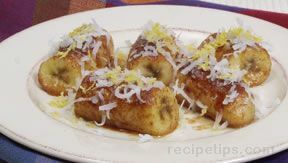 Place banana sections in the baking dish and roll in melted mixture until they are well coated. In a small bowl ,combine brown sugar and cinnamon. Stir until well blended and then sprinkle over the bananas in the baking dish. Place in the oven and bake for 20 minutes.